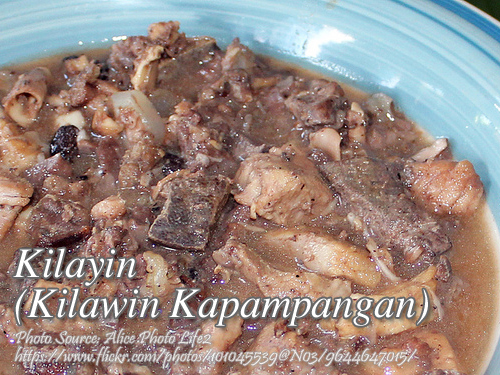 Kilawin kapampangan or popularly known as “kilayin” is a kapampangan dish made from minced pork lungs, chopped pork meat and liver, stewed in vinegar with spices and aromatics. When I was still not very familiar with this dish, as I’ve heard from my wife, that this is a tasty dish. She knows it because her mother was kapampangan. I thought it was “kilawin” or ceviche and what I have in mind is the pork lung and innards are only soaked in vinegar and eaten. So I was disgusted with the dish just thinking of eating it makes me puke. But one day our kapampangan neighbor who became my wife’s friend gave us a bowl of this kilayin. I was wondering why it is cooked since it is “kilawin”. When I tasted it, it was delicious! So my wife was motivated to cook this dish and from that time it was included our regular monthly menu. Bit of tip from a facebook page member (Catherine Eugenio Laxamana): Marinade the chopped pork lungs with vinegar, onion, garlic with salt and black pepper in another bowl and after a while put it in a pan let it boil, when it dries up add little cooking oil and fry it, so that the pork lungs will be cooked properly and remove the fishy taste. When it’s done, thats the time to add the pork and the other ingredients. Kilawin kapampangan or popularly known as "kilayin" is a kapampangan dish made from minced pork lungs, chopped pork meat and liver, stewed in vinegar with spices and aromatics. Marinate pork in vinegar. In a pan saute garlic and onions. Add pork lungs and the pork and vinegar, ground pepper and bay leaf. Simmer over low fire, when pork is almost tender add liver, pepper and salt to taste. Continue cooking till pork is tender and liquid is reduced. Hi Ramon, thanks for the nice comment! Cheers!